If a parent and/or student has registered in Charms but is not receiving Band or Orchestra email, please login to Charms and double-check the email address is correct (we can't do that for you). Please be aware: email accounts which require senders to verify will not receive band/orchestra email. Addresses changes must be made by the parent or student. Thanks for helping us ensure Band & Orchestra email reaches your email Inbox! Please consider making a contribution in support of our musically gifted students. musical excellence in our secondary school band and orchestra programs. As a 501(c)(3) organization, your contribution to RBOPO is tax deductible. please feel free to mail a check to P.O. Box 39, Fairfax Station, VA., 22039 or online via Paypal. Thinking of relocating to Fairfax County? Learn about our Music Program! 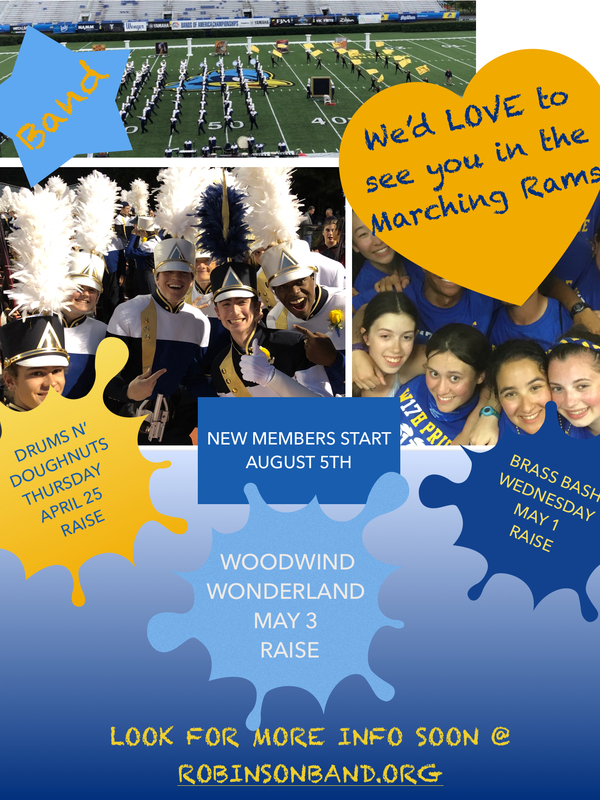 Become a Robinson Band & Orchestra business sponsor! Display your business logo here! recognizing High School Concert Bands of Outstanding Musical Excellence. The Lunsford/Behrend Scholarship Fund was established in 2007 by James W. Robinson alumni in memory of former band directors James G. Lunsford and Jack Behrend. Scholarship eligibility is open to graduating students in the Robinson Band program who plan to continue to participate in music at the college level - a music major is not required. For more information about the scholarship and contributions to the fund, visit http://www.lunsfordbehrend.org. James W. Robinson Secondary School is one of three secondary schools (grade 7-12) in Fairfax County and part of a school system serving 165,000 students in 180 schools. With a student population of 4000, over 1200 Robinson students are enrolled in one or more music classes. Instrumental music instruction begins in the fourth grade for strings and the fifth grade for band at the six feeder elementary schools in the Robinson pyramid. 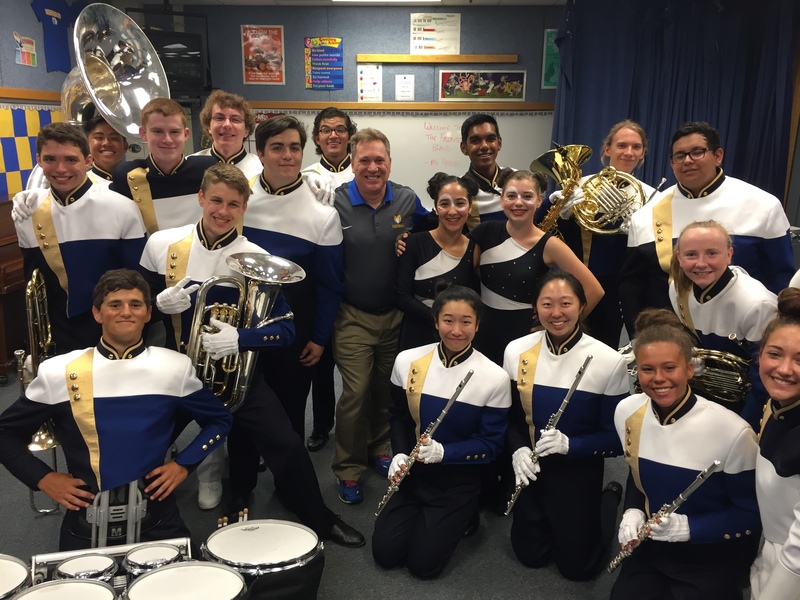 The Robinson Secondary School music department has been designated a Blue Ribbon School five times by the Virginia Music Educators Association. The music curriculum at Robinson includes twelve concert bands, four jazz bands, marching band, six orchestras, six choirs, music theory and IB music classes, eight guitar classes, and numerous small ensembles. Nine faculty members instruct these classes and performing organizations in Robinson's Lunsford Hall. A "Sudler Silver Cup" band, the highest honor bestowed on middle school bands, the Robinson Middle School Symphonic Band consistently receives superior ratings at district festivals. The group has appeared at the Virginia Music Educators Association Conference three times and has the distinction of performing twice at the Midwest Band and Orchestra Clinic in Chicago, Illinois. As one of the only bands in the United States to hold two Sudler Flags of Honor, the Robinson High School Symphonic Band consistently receives superior ratings in grade VI literature at district festivals and is a twenty year recipient of the Virginia Honor Band award. 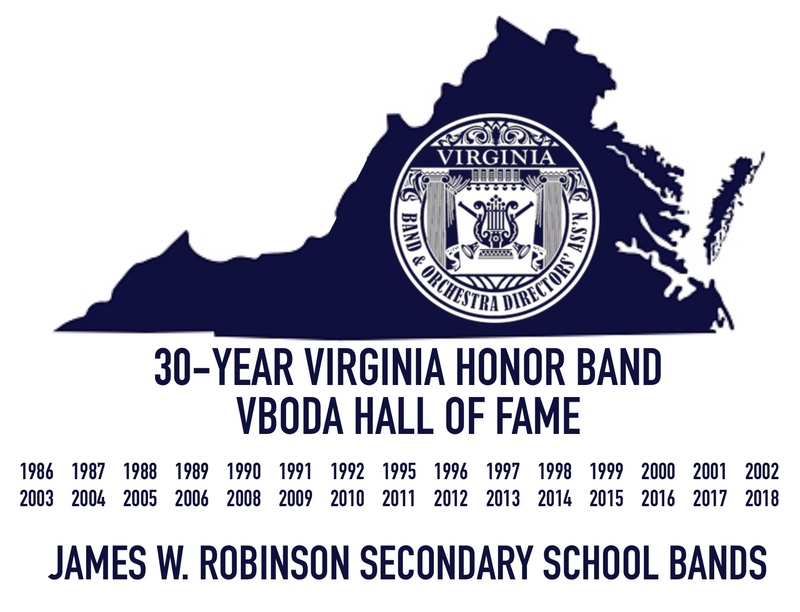 Robinson is one of four bands in the VBODA “Hall of Fame” for this accomplishment. In the last ten years, they have hosted or appeared with the University of Tennessee Wind Ensemble, the University of Illinois Trombone Choir, the Tennessee Tech Tuba Ensemble, faculty brass quintets from the University of Kansas and Illinois, the United States Marine Corps Chamber Ensemble, “Boston Brass”, musical humorist, Peter Schickele, and National Symphony Orchestra Maestro Leonard Slatkin. They have performed at the Virginia Music Educators Association (VMEA) Conference four times as well as at the ASBDA convention and the Midwest International Band and Orchestra Clinic. The symphonic band is a part of the 180 member "Marching Rams" which performs and competes successfully during the fall season.